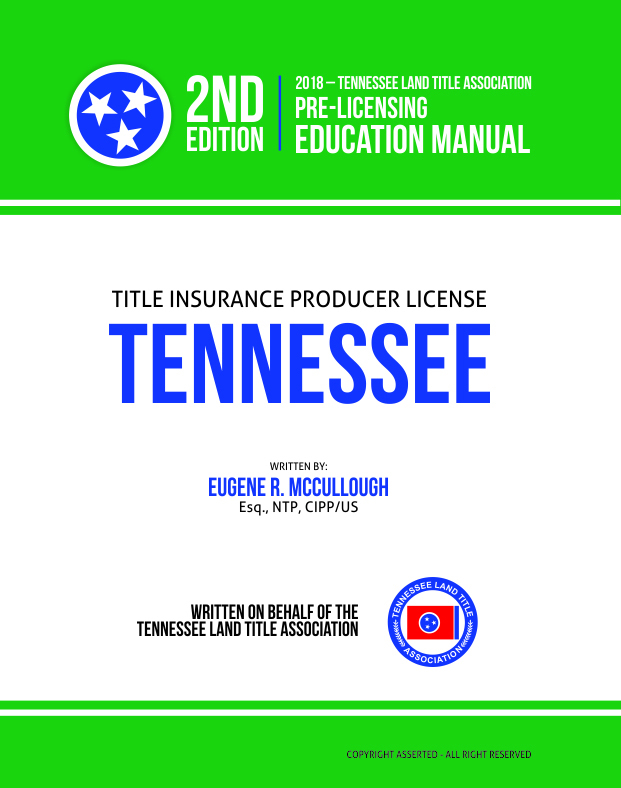 The Tennessee Land Title Association is proud to provide its TENNESSEE PRE-LICENSING EDUCATION COURSE & MANUAL to industry members looking to obtain their Tennessee Title Agent’s License, or to use as a helpful office reference and office training tool. This study guide (with 380+ pages of material) covers all Department of Insurance-required topics and includes 40 on-line chapter assessment quizzes to test comprehension of the course materials. Participants study the materials at their own pace, taking an online assessment test at the end of each chapter. Once you have passed each of the 40 on-line chapter tests with a minimum 70% success rate, TNLTA will issue its Certification of Completion to the Pre-licensing Course. You must present the Certificate of Completion to the testing facility (Pearson VUE) when taking the Producer Licensing Exam. TNLTA Members: To take advantage of your member discount, please log-in before completing the registration form. The prices shown include the cost of the course and the workbook ($199 TNLTA Members/$249 Non-members) plus shipping, handling and sales tax. Books ordered on-line will be delivered within 10 days of ordering. Please use the correct shipping address when completing the registration screen. The Tennessee Department of Commerce & Insurance is responsible for the licensing and regulation of insurance producers, business entities, and title agents. 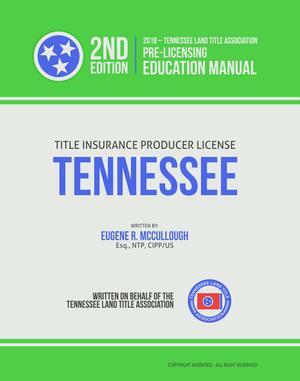 For Agent/Producer Licensing Packets, Most Current and Detailed Instructions & Forms visit the Tennessee Department of Commerce & Insurance Agent Licensing Section Kim Biggs-Director at https://www.tn.gov/commerce/article/ins-agent-producer-licensing-packets-instructions-forms) or call 1-888-416-0868 or 615.741.2693. Step 1: Complete education requirements through an approved pre-licensing education provider (such as the TNLTA) and obtain your Certificate of Completion. Step 2: Schedule and Pass a Tennessee insurance licensing exam. Tennessee title insurance licensure exams are provided by Pearson VUE test centers. For more information on Pearson VUE or to schedule, find a local test center, reschedule or cancel an exam go to www.pearsonvue.com/tn/insurance or call 800.274.4957. Step 3: Register for Fingerprinting/Background checks. The Tennessee Department of Commerce Instructions (Rev 8/2011) state that online registration is available 24 hours a day, 7 days a week online at www.identogo.com, or for assistance, call 855.226.2937 to speak to a representative. Step 4: Apply for a Tennessee insurance license by submitting your application and filing fee ($50) to the TN Department of Commerce and Insurance electronically at www.nipr.com . *Some applicants may be exempt from written examination requirements. Contact the TN DOI directly for more information.